Jason Matthews - Novels - Self Publish - Connect: Vistaprint, I'm addicted. Check out these business cards I just made. They took me under an hour and the program was amazingly user friendly. I went ahead and ordered matching magnets with little calenders, couldn't help myself. 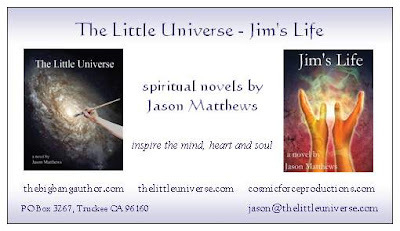 As soon as they arrive, which should be Feb. 10th, I'll be giving some magnets away at my website, thelittleuniverse.webs.com along with a bunch of other free stuff. Finally I'm addicted to a good thing. If you haven't been to Vistaprint, do yourself a favor and check it out.